Upon hearing this, the boy went away extremely happy. After months of diligently taking care of the rose, the son approached his father once more for the rose and the father consented to him taking the rose. The night before he was to get his prize, he could hardly sleep! The next morning, he approached his rose and after a moment’s pause, bent down to uproot it from the ground. 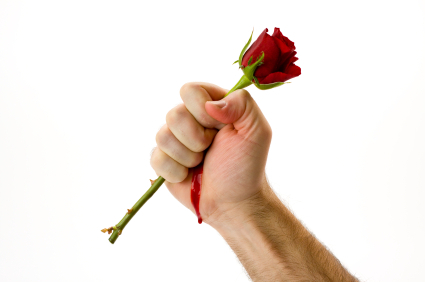 But when he grabbed the stem of the rose to pull it out, he felt a sharp pain in his hand. So, he quickly let go of the rose and looked at his hand only to find blood all over his hands. Not understanding what happened, he took a closer look at the rose and found that its stem was covered with thorns! ‘Son, there is no flower as beautiful and as desirable as the rose. But the rose is not perfect – just as no flower is perfect. Son, you must learn to handle the rose if you are ever going to enjoy a good relationship with it. Like many others that I have given a chance to get to know the rose, you only chose to see the beauty but you blinded your eyes to its thorns – and so you got hurt. Others who saw the thorns decided that they no longer wanted the rose – so they settled for less and missed out on the best thing I had planned for them. Son, you desired an idea of the rose but never the true rose. You must desire the entire rose – even with all its thorns. See, those thorns you do not like right now are the same weapons that the rose will use to defend itself against other false gardeners apart from you. See son, the rose is only good to those gardeners that handle it with the gloves of love and will only respond to those who treat it with love! This is how I have on purpose brought up the rose. ‘Son, see how you have hurt my rose! You rejected it when you found that it had thorns. You have left it uprooted so that it is no longer fully secure in the ground. You have left my rose vulnerable and insecure. This is wrong of you! You took something that was secure where I planted it and now you have left it insecure because you did not adequately prepare yourself for it. My rose never asked for you but you asked for it. My rose did not fool you by hiding its thorns but you fooled yourself. Because of your hurry, you blinded yourself. Now son, I will go back and replant my rose for now . I will make her secure and lovely once more. My question to you now is this: Do you still want my rose; do you want me to teach you how to handle it? ‘Father, I am sorry that I have hurt your rose. I was so enamored by the rose that I forgot that you are the master gardener! How prideful of me to think I could take care of this rose without asking for your help! Now, I will delight myself in learning from you so that my heart’s desire (the rose) does not turn into a thorn in my flesh’. Over the next few years, the son learned from his father how to take care of the rose and eventually got the rose in due season – when he was mature and seasoned enough to handle it. So in the end, the father was gracious to both the rose and his son. Food for thought: God longs to grant us our heart’s desire, BUT we must not make our desire our delight. If we do, then our heart’s desire has become an idol that becomes our thorn in the flesh and keeps us from the father. When we fail to delight ourselves in the Lord, what was meant to be a blessing becomes a source of pain! If we want to do right by our rose, we must put God first. When we do, he will give us what we desire in due time (see Psalm 37:4).